Which type and where should I apply the house paint? This question will take a bit of mental work to answer. Choosing an interior paint or exterior paint will depend on the material or surface, existing finishes, environment and performance level needed. Most modern paints can be divided into two categories, acrylic and alkyd. These are commonly called latex and oil base. Both types have their advantages and disadvantages. Paint is a liquid that dries to form a protective film on the surface. Paint mainly consists of pigments, binders, additives and solvents. Each type of finish will have its own special blend of ingredients that enhance its performance for a given surface or environment. The most common binders are latex, vinyl, acrylic and alkyd. Latex, vinyl and acrylic are formulated with water as the main ingredient. As a result these types of paints are known as “water base”. Alkyd uses mineral spirits, AKA paint thinner, as a solvent. Since earlier paints used natural plant oils, such as Linn Seed and Tung oil, as a binder instead of alkyd resins this type of paint became known as “oil base”. You have two types of paint to be concerned with latex paint and alkyd paint. Both types have excellent qualities but are incompatible with each other. A rule to follow is “oil over water never water over oil”. This means an oil base paint, alkyd house paint, can be applied over water base paint, latex or acrylic house paint, but never the other way around. A primer must be used before applying latex over oil base paint. Latex or acrylic paints are the most common and popular types of paints on the market. Because its primary liquid is water, Latex dries quickly, is almost odorless (at least to my nose), clean up is with water and is environmentally friendly. Most water based paints contain a small amount of volatile solvents also called Volatile Organic Compounds, VOC. These compounds can be a problem with some people. No VOC paints are now on the market that can be used in these situations. The main limitations are sensitivity to the cold, should be applied above 50 degrees F., and has a tendency to show brush marks when compared to alkyd finishes. Lower temperature versions can be applied at 35 degrees. Keep in mind, this paint cannot be allowed to freeze both during and for a few hours after application. The paint film will be severely damaged if allowed to freeze. The quality of latex paint is affected by the type of binder used. The best water based paints use 100% acrylic resin. Some manufactures use the term acrylic latex paint. Many professional painters prefer to use alkyd house paint, especially on interior trim. It is durable, stain resistant and dries with less brush marks. Plus it is a dream to spray with a HVLP paint sprayer, providing a factory like finish. The smell comes from the very high amounts of VOCs contained within the paint. Must be applied with adequate ventilation, plus the smell will stick around for a while. Slow drying has its advantages; the paint flows on the surface producing a smoother appearance. Unfortunately it will have a tendency to sag if applied to thick. This means more coats will be needed and the project will take more time. Elastomeric is a truly unique exterior paint with rubber like qualities. Elastomeric paint was developed for cracked masonry, such as stucco. This is a very thick paint that can bridge over small cracks and stretch with the surface. A good choice for some wood surfaces. Direct to Metal paints, DTM is primarily an industrial finish, but I have seen some versions available to the general public. I have used this type of paint on steel siding with incredible results. If you have some metal that needs to be painted, give DTM a try. Primarily an exterior product. Epoxy paint, a two-component paint that is very tough and chemical resistant. Although interior only, this stuff is as tough as it gets. Most homeowners will use it on their garage floors, but epoxy can be used anywhere a super tough finish is needed. Urethane floor enamels are the perfect choice for painting a wood floor. Typically a very shiny paint with all the positive attributes of oil base enamel. Very hard and scratch resistant. I use urethane paint on painted porch floors with great results. Every house will need painting some day and someone will have to choose what type of paint to use. There isn’t a simple answer, use this brand and it will last forever. The type of finish you choose depends on many factors. Type of surface affects the type of paint to use. Example, wood trim and siding expand and contract with the seasons plus can split over time. The paint needs to expand and contract with the wood with out cracking. A good elastic paint is 100% Acrylic with a satin sheen. The environment also affects the paint and the surface it’s applied to. Regional weather extremes need to be taken into account. Every region has specific needs as to the best possible house paint to use. UV exposure is another factor that affects the finish paint. Most alkyd finishes degrade faster when exposed to UV light. Choosing interior paint is much easier than choosing exterior paint. Your needs and the environment are much easier to define plus it remains fairly constant over time. Plus the number of products is less. Abrasion Resistance – Some areas of your home receive more ware and tare than others. These areas could be hallways, doors and trim or a child’s room. Alkyd paints can offer excellent resistance to scuffing and is a good choice for door, trim and floors. The acrylic paints offer lower odor, ease of application and excellent flexibility. Humidity – Exposure to water will have a huge effect on the life of the finish. In areas such as bathrooms, saunas, and pools this is especially true. Both top quality oil base and acrylic finishes are resistant to moisture. The acrylic paints are better in most situations. Higher sheens should be used in areas that receive more humidity. Sheen – The sheen of the paint affects how strong and flexible the paint film is and the abrasion resistance. The more sheen the more resistance to washing and the affects of abrasion. Choose a paint sheen that matches the conditions of the surface and your decorative needs. Color – Intensity of color and the need for multiple coats affects your choices as well. Water base paints dry faster allowing you to apply another coat sooner plus quality acrylics are thicker and offer better coverage. This is especially true for exterior painting. Using $25 per gallon paint can mean repainting in 4 years and $45 per gallon paint could last for 10 years. Cheaper materials will force you to repaint your home much earlier as compared to using a top quality finish. What would you rather do, paint your home or something else? Another consideration is the labor involved to prepare a home for painting and then apply the finish. The cost of labor, yours or a painting contractor, must be accounted for and will increase on a yearly basis with increases in the cost of living. Your labor also has value. Think of what it costs you in lost time from your job or missed recreation opportunities. Let’s assume the cost of painting a small exterior with $25 per gallon paint is $500 for materials and $2000 for labor, this equals $2500. Now also assume the paint job last for 4 years. In 8 years, with no increase in material or labor cost, the paint job cost is $5000. Using a better paint can double the time before repainting needs to be done, lets assume 8 years for arguments sake. The cost of materials goes up a little, it’s now $850 but the cost of labor remains the same. This paint job now costs $2850. The difference between these two examples is $2150 for an 8 year period. The better paint saves a considerable amount of money over time when compared to the cheaper paint. Of course this is a dramatic example. 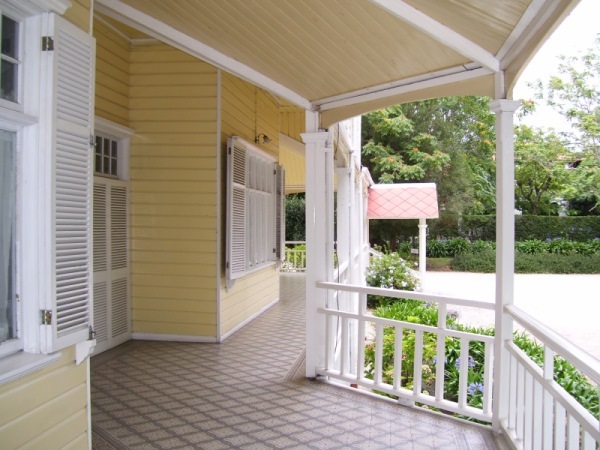 The labor costs can increase with the better paint job, especially if more intense exterior paint preparation is used. This translates to a higher cost per year for the cheaper house paint and higher maintenance cost for you. The savings will be higher if a painting contractor is hired. Spending the money now for quality materials and craftsmanship will save you money in the future. 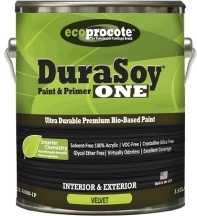 DuraSoy ONE Paint & Primer, A premium interior & exterior non-toxic paint and no VOC paint that is virtually odorless.